A quarter to midnight, I'm woken up by an explosion of some kind. It is quickly understood that there is neither volcanic eruption nor earthquake, but fireworks. But what a firework! The earth shakes, it feels like a grenade drop. There is no glare in the sky as far as I can see. It's on for 10 minutes, and then you've been awake. This morning, it's confirmed that it was the end of the weekend's competitions and that it has nothing to do with the day off today. Today is the "Verslunmannarhelginn", a day off for the merchants. Everyone is closed - except Nettó. I'm going on an excursion. 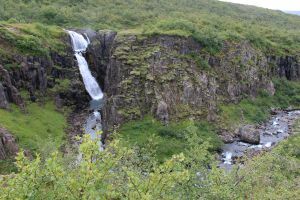 One of the closest attractions in the area is Fardagafoss. It's fine, because I'm going to Seyðisfjörður, so I'm sure I'll know it tomorrow. I have to go up to the parking lot, it says, and it's there even just gravel, but Fardagafoss it says, and this is where the trail starts, unless you've started down at the city. 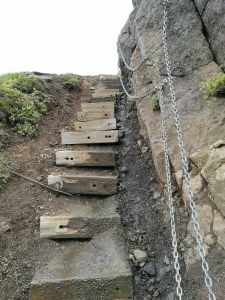 The last piece there are chains to hold, because it can be wet and greasy. I leave my bag and the big camera before I get down. You should be able to enter BEHIND the waterfall. 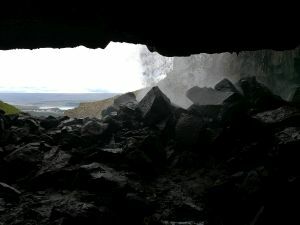 It's like a cave, but maybe you get wet? Amazingly, you can do it without getting wet. This is the first time I have seen a waterfall from behind. There is a beautiful view from here, both over Egilsstadir and Lagerfljot lake, which ends up in the distance with Snæfell behind. 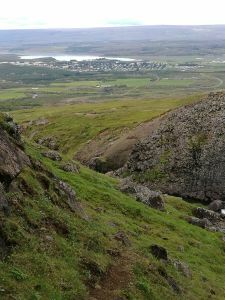 Snæfell, which I had in the distance, the first day when I started. This will end the ring. A simple solstice will make it. Only up here where I'm sitting. There is almost no wind. Egilsstaðir is a focal point here in the east. There is an airport in addition to the Ring Road going through. 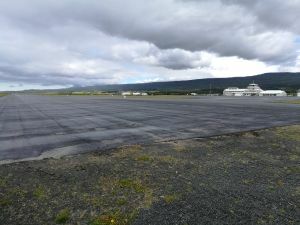 After lunch I drive past the airport to Fellabær and south of the road on the other side of the lake. I have got the idea that there must be a viewpoint here. Driving up a small gravel road I leave the bicycle and climb over the rocks. I find the highest point and the view is nice, but the weather seems to be worse. Quite right, it gets "skurir" before I'm back to the airport. Fortunately, you don''t get that wet, but I have to hurry home and get the towel and a pair of socks indoors. Now I think I'm as smashed as after a 70km day, but I did not sleep very well after the fireworks. Lying there writing a new mail to HI Hostel Iceland in my head. I got an answer the other day from an Helena Oladottir, but I think it was too vague. Got it written and sent this morning. Just passed Nettó on the way back and now I'm sitting with coffee and a "müslikaka" in the common room. Previously a camper arrived on Danish plates. They are also going with the ferry on Thursday. There was also an older Ghandi-like indian, waiting for the bus to Seyðisfjörður. When it came, he shook my hand for goodbye, even though we had not spoken. Be happy to see one of his own age? I asked if he should stay in Seyðisfjörður, because then we might meet tomorrow? He would be delighted. Then it rained for another hour while I was in the tent. One must say that the weather hit exactly this time: 1.5 mm between 15 and 17. But It was 18 before it stopped.